More than just a dog walk! You will be looking for a dog walker for your dog for various reasons. You may work all day. You might not be fit enough to give your dog the walks he or she deserves. Whatever the reason, I can guarantee your dog will love to run around with other dogs, chase balls and sniffle and snuffle amongst the undergrowth on morning or lunchtime adventure trek. 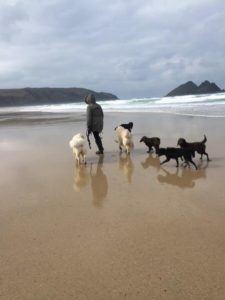 I specialise in providing fun group adventures that provide excellent socialisation for your dog. Adventures last at least an hour before your dogs are returned home for a well deserved snooze. So instead of sitting in work worrying that you’ve left your dog home alone all day, you can rest assured your pet will have been out with the other dogs having a wonderful time. Walks are fast paced and active. At Piran Pets Adventure Treks we love retrievers. We specialise in providing walks tailored to suit this amazing, cuddly, bouncy, water loving breed. Every Wednesday afternoon your retriever will love a massive hour and a half adventure, playing and running around with dogs of the same size, breed and temperament. If Wednesday doesn’t suit, there is also a similar walk for big or active dogs on Monday and Friday afternoons. This can free up some time for you to go shopping or to simply have a break from the demands of your four legged friend! Ideal for your larger or active dogs, this hour and a half Monday and Friday adventure burns off lots of energy so you can enjoy a relaxed and happy hound. We usually go and play in the woods at Idless where the dogs love to chase each other through the trees and splish splash splosh in the stream. All sorts of little dogs come and enjoy this walk, including Chihuahuas, small spaniels, cockerpoos, cavapoos and schnauzers. Your little dogs will enjoy running around with dogs their own size. Your dog may be scared of larger dogs, or may not be able to walk as far as the bigger dogs. So this massive adventure would be perfect for your cute little pooch! I’ve been walking dogs professionally since January 2009 and have public liability insurance. I specialise in providing fun group walks – the dogs love to interact with each other. We always walk in safe places and dogs are transferred to and from the walk in the safety of a van. It’s all about quality of life. Your dog is exercised and socialised in a fun environment leading to a healthy, happy dog. At Piran Pets Adventure Treks we provide more than just a dog walk. Your dog’s adventure starts here. Give me a call on 07737843781. Alternatively you can email me at nicky@piranpets.com.